The Southern Carpathian mountains of Romania cradle some of the most beautiful riding in Europe. Two amazing highways lead you over these rugged peaks. 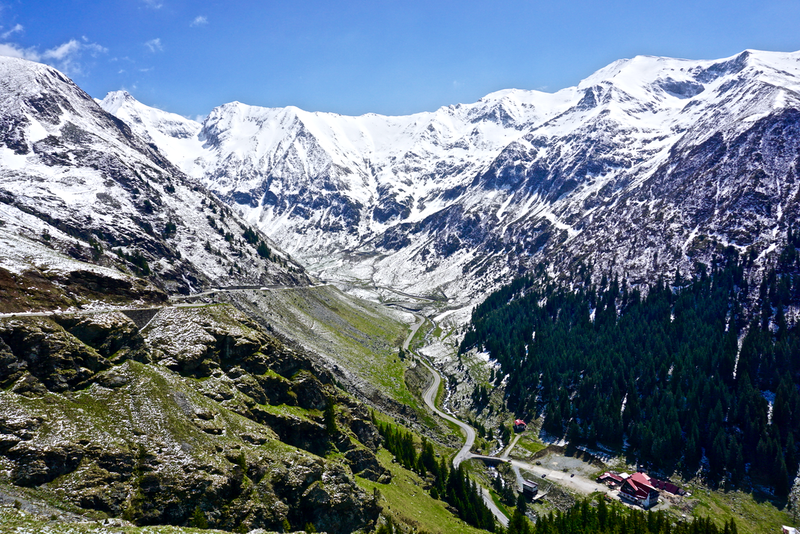 The Transalpina and Transfagarasan both have an interesting history and deliver jaw dropping views. They were both amazing, even though I couldn’t reach the final sections of either because of heavy spring snow. Gives me a reason to go back someday. First I had to make my way there from Zagreb, Croatia. Heading towards Serbia, you start to see the effects of the war that took place. The Croatian War of Independence was fought from 1991 to 1995. After Slovenia was the first to declare independence from the former Yugoslavia, Croatia was soon next, but unfortunately it wouldn’t be as easy for them. Ethnic Serbs living in Croatia, supported by Serbia, opposed this and wanted Serb-claimed lands to be part of a Serbian state. The Yugoslav People’s Army, serb-controlled, was also involved. In some areas, including most of the coast, you don’t notice any evidence of a war taking place just twenty years before. This changes as you head east towards the Serbian border. The villages begin to show the usual signs of bullet-riddled homes and buildings. Much like in Bosnia & Herzegovina. I came across an old church that was half destroyed from the fighting. A Croatian man stopped to chat with me and gave me a little history lesson. The church had been occupied by Serbian forces during the war. I spent a few days in the city of Belgrade, which sits at the confluence of the Danube and Sava rivers, and where the Balkans meet the Pannonian Plain. Translated to “White City”, it was one of the most important cities of Europe in prehistoric times. In the 6th century BC, the Vinča culture evolved around Belgrade. Belgrade was passed from Ottoman to Hapsburg rule frequently and almost completely destroyed during the Austro-Ottoman wars. Eventually it was again named the capital of Serbia, and then the capital of Yugoslavia until the final dissolution. From March till June, in 1999, there was a Nato bombing campaign. The military operation was against the Federal Republic of Yugoslavia during the Kosovo War. NATO claimed that the Albanian population in Kosovo were being persecuted by Serb paramilitary forces, Serbian police, FRY forces, and that military action was needed. NATO described it as a humanitarian intervention, while the FRY describing it as an illegal war of aggression against a sovereign country. It was only the second combat mission ever undertaken, following the 1995 Bosnian campaign. The bombings destroyed bridges, public buildings, private businesses, industrial plants, and barracks and military installations. Around 500 civilians were killed. I won’t get into the whole Kosovo wars, but it’s definitely worth learning about, and the issues are persisting to this very day. A lot of the damage to Belgrade has been repaired or demolished, but there are still some sites that sit as reminders. After a short time in Serbia, it was on to Romania. Romania is a sort of Latin island in the middle of a Slavic ocean. Around 100 AD, the Romans came, which fought the local Dacians until conquering them. Afterwards Dacia became a Roman province and settlers from other parts of the Roman Empire moved in and the local people became ‘Romanized’, and began to speak Latin. However, Roman rule didn’t last long, and in the 3rd century the cost of defending Dacia from ‘barbarians’ became too much. In 271, the Roman Empire withdrew south of the Danube river. For centuries, waves of migrants came, including the Huns, Avars, and Slavs. By the 13th century, Hungarians ruled Transylvania and persuaded Germans to move in, although the majority of the population was Romanian peasants. In the 14th century, Romanians united and formed the first Romanian Principality, Wallachia, and later on Moldovia was formed. Most of the peasants became serfs (half way between slave and freeman). During the 15th century, the threat from the Turks arrived and were fought by Wallachia and Moldovia. This was the time of Vlad the Impaler, which was who Bram Stoker named his character after in the book Dracula. The 16th century saw Transylvania fall under Turkish rule, although Wallachia and Moldovia were able to remain independent for some time. Romania wasn’t free of Turkish rule until declaring independence in 1877. Hungary still controlled Transylvania. During the Second World War Jews and Gypsies from Romania were deported and murdered. Romania was allied with Germany to start WWII, but after a coup in 1944 Romania switched sides and declared war on Germany, which led to Hungarian troops being driven out of Transylvania and it becoming part of Romania again. After the war, Russian troops were stationed in Romania, which made communism inevitable. In 1965, Nicolae Ceausescu became ruler of Romania. He was a harsh ruler and people were subjected to extreme poverty and repression. He remained in power until the communist regime suddenly collapsed in 1989. His fellow communists deserted him and he was arrested, which led to him and his wife being shot on Christmas 1989. It was a difficult transition from communism to a democracy, but they have went on to become a member of NATO and the EU and one of the hidden gems of Europe. It’s an amazing country filled with beautiful people and wild nature. Slowly the temperature began dropping and the pine trees had more and more snow on them. A barrier and some signs told me that the push to the top was closed, but I had to see. Many times I’ve gone anyways when the roads are apparently closed and more often than not it’s open and a great ride all to myself. It’s another level of beauty as you rise into the dark blue skies and mountainous snow-covered landscape. It felt like riding up into heaven, if that’s a feeling. One minute it would be clear skies and the next would bring a white-out blizzard, only to pass after ten minutes. With only a few km to the top, I thought I was getting over for sure and was buzzing with excitement. Then suddenly as I rounded a corner the road vanished into a deep snow-drift. Around one km from the top I was stopped. So close, but completely worth it. The views out over the mountains, valleys, and ridges was breathtaking. The blue skies, yellow lined road, bright white snow, dark green forests, and light green grasslands all contrasted against each-other to for something special. If the north side was so beautiful then I would have to try the south side, so I made my way back down and did a big loop around to the south. I held out a tiny bit of hope that maybe the road would get plowed soon and camped under a pretty pink sunset. I woke to clear skies and began effort number two at getting to the top of the Transalpina. The steep curvy roads took me up into harsher weather quickly. The clouds got thick and menacing while the temperature felt to have dropped a hundred degrees. Suddenly the wind cut though every tiny opening in my clothing and chilled me to the bone. As I got closer to the top, the shaded areas of the road were iced over, and if there’s one thing I’ve learned its that unfortunately riding a motorcycle on ice is impossible. I still try like an idiot though and find out the hard way. I made it a few feet on the first patch before sliding out and dropping the bike. The worst part was trying to get it up. Imagine trying to lift 500 ponds of metal on an ice-skating rink. I had to pull and drag it back aways where I could get a better footing. It’s a miracle I was able to get it back up on my own. After stopping and cooking up some hot coffee while waiting for the sun to thaw the ice out, I got impatient and took things into my own hands. I used rocks and smashed and carved paths through the icy sections. It probably sounds ridiculous, but I really wanted to see the top. Again, about a km from the top I was basically stopped in my tracks. After one more crash on the ice (above pic), I parked and hiked up a little further. This led me to deep snow across the road and violent wind stinging my face. The top km or so of the Transalpina just weren’t meant to be this time. As I started back down, a plow truck and back-hoe slowly made their way towards the top to start clearing it. Back at lower elevation it was a beautiful day. I met some real nice french bikers to share a snack with, and the lady gave me one of my favorite decorations I have on the bike, YOLO. I left the Transalpina a bit sad that I couldn’t complete it, but I had a lot to look forward to. The Transfagarasan was next. I camped in a pretty little river canyon under Dracula’s Castle the night before trying it. At the southern end of the Transfagarasan, just before the lake, there’s perfect camping areas along this river. The Transfagarasan is also known as Ceaușescu’s Folly, after the ruler Nicolae Ceausescu. He had the road built from 1970 to 1974 in response to the invasion of Czechoslovakia by the Soviets. He wanted to ensure rapid military access in case of invasion. It was built mainly by military forces and had a high financial and human cost. Over six million kilos of dynamite was used by mainly untrained junior soldiers. Officially, 40 soldiers lost their lives, but unofficially the number is in the hundreds. It’s the second highest paved road in the country and might be the most stunning. I was pretty sure it would be closed. It usually doesn’t open until late June because of heavy snow, but I had to go ride the hair-pin turns through the craggy peaks to see for myself. The route twists along a large lake before heading up into the rugged mountains. I got stopped by deep snow a couple of km from the top, which seems to be happening a lot lately, but with no regrets. The views from up there were comparable to some of the epic ones of the Hunza Vally in Pakistan. I don’t think it would be as pretty without any snow, so I’m glad I got up there when I did. The other bonus was that I had the entire road to myself without worrying about jackass drivers around every corner. Two other motorcyclists came up after me and were very disappointed it was closed and headed back down a little annoyed. I rode down with a massive smile on my face. I could have sat up there looking over it all for hours. At the southern section of the Transfagarasan, near the village of Arefu, you can climb up 1,480 steep stairs to Poenari Castle. This was the residence of Vlad the Impaler, or otherwise known as Dracula. He was the inspiration for Bram Stoker’s Count Dracula. It was first built in the 13th century by Wallachians and in the 14th century was the main citadel for the Basarab rulers before being abandoned. Eventually, Vlad came along and saw the potential in a castle perched on a high rock. He had it restored and consolidated and turned it into one of his main castles. At the entrance, they’ve impaled two mannequins on large spikes. It’s a little creepy and funny looking at the same time. Apparently, this is what Vlad enjoyed doing to his enemies, and I was told the people sometimes stayed alive for up to three days. I don’t see how they could have, but either way, not a nice way to go. This entry was posted in adventure travel, border crossing, camping, Kawasaki KLR650, Motorcycle world travel, Photography, Romania travel, wild and tagged adventure, beautiful, best route, dracula, highway, motorcycle, photography, poenari castle, romania, serbia, snow, spring, transalpina, transfagarasan, travel. Bookmark the permalink. Beautiful pictures ! The road was closed at the end, but the landscape was only for you… that’s your best reward.